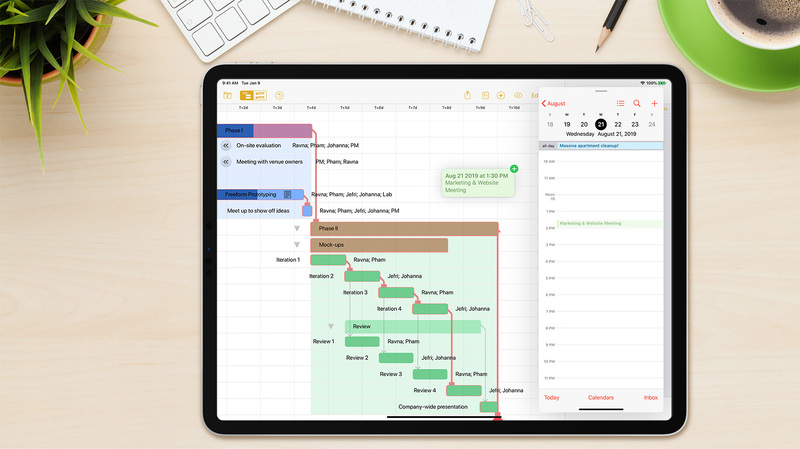 View, edit, and organize your tasks with OmniPlan’s interactive — and beautiful — Gantt charts. Get an overview of your project, assign resources and update task completion, and gain instant access to your typical toolbar buttons. All without leaving the keyboard. We don’t want you working too late...but you totally could. Use Dark Mode when the lights are low, your eyes are tired, or you just like the way it looks. Have an all-hands meeting and everything going as planned? One button to update progress across the board. Full keyboard support isn’t just on Mac. Work out a plan even faster with hardware keyboard shortcuts on iPad. Protect your projects from the slippery fingers of toddlers or the prying eyes of your frenemies. Use a password or TouchID to keep OmniPlan private. Fine-grained controls allow you to concentrate on specific tasks. Focus on specific resources, high priority tasks, date ranges, and more. Scheduling violations are marked if they occur, and OmniPlan suggests ways to fix them. 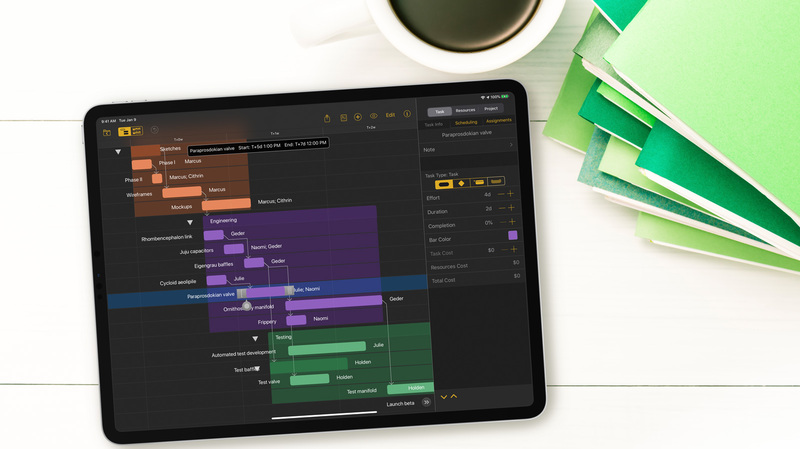 OmniPlan can automatically optimize your resources and tasks throughout the project to help finish on time. 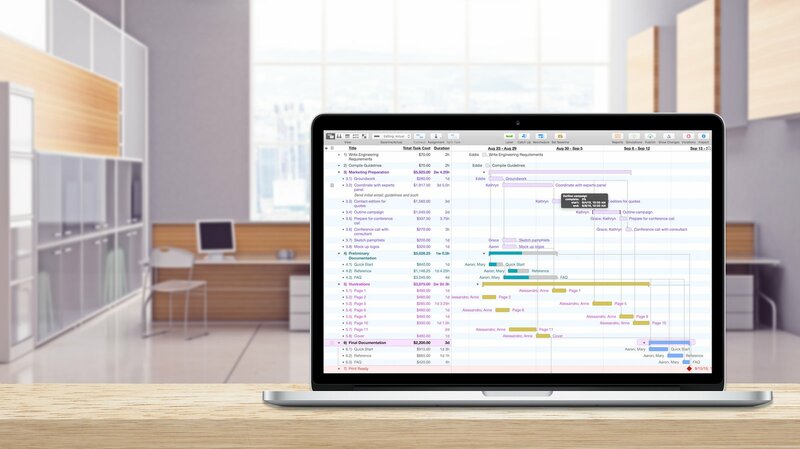 Maximize resource efficiency by allowing OmniPlan to split individual tasks when leveling. Highlight the important tasks that have a direct influence on the finish date of your project. Share your project in a variety of formats: plain text, iCal, images, and more. Set multiple baselines—snapshots, if you will—for each project, then reference them later to track progress. A brand new way to visualize the flow and dependencies of your project. Zoom in. Zoom out. Share you project in a variety of formats: plain text, iCal, images, and more. Know precisely what changed and by whom. Enable Change Tracking to approve or deny changes from others. Use our vast AppleScript library to automate all sorts of things in your Plan. Use OmniPlan’s built-in EVA formulas to get a grasp on budget and value. Set a Baseline and track progress. OmniPlan supports importing and exporting Microsoft Project® 2016 and earlier files. Run hundreds of simulations with a click. OmniPlan predicts the likelihood of hitting milestones on time. Put together a hub for the projects you choose. Multi-Project Dashboard focuses on Resource Load and easy-to-understand visuals. Customize your report’s styles ‘til kingdom come, or use one of our beautifully modern built-in sets. Bring in teammates’ calendars to avoid overscheduling. Publish a report on save. Share with a team. And so much more. Even cartoon villains need help with planning their diabolical projects. 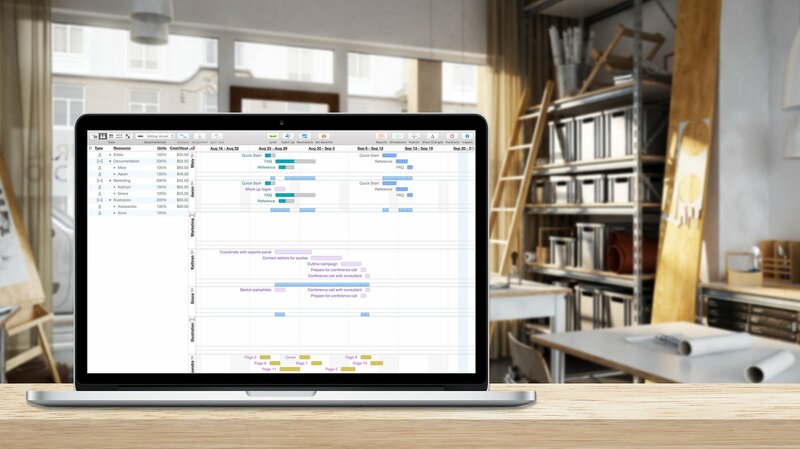 Deciphering Gantt charts, wrangling resources, and setting baselines — just what does that all mean? Follow along, and learn the concepts in our swank sixties spy series, Project Planning 101. Education and Business pricing available for Mac. After a 14-day trial, Standard and Pro features are unlocked with an In‑App Purchase. If your Mac doesn’t meet the system requirements, you may have better luck with a previous version from the downloads archive.